The Very Hungry Caterpillar Comes Alive! What does a hungry little caterpillar, a confused chameleon and a curious cloud have in common? Beisdes being firm book favourites from Eric Carle, they were all magically brought to life through the ingenious use of florescent puppets and black light at the 'The Very Hungry Caterpillar & Other Eric Carle Favourites' show - and trust me - this show has lots of magic. This was not my first time watching the show though. I first brought Ash and Ayd to catch it when it was here in 2008 and I remember Ash telling me that he enjoyed it so much that he wanted to watch it again right after the show ended! Oh gosh, see how young the boys were back then??? So this time around, it was their little sister's turn to get acquainted with the caterpillar and friends. But before the show, we had the chance to get up close with the puppets used in the production in an exclusive Puppetry Workshop. The first thing that floored me was when I realised that there were only 1 stage manager and 2 puppeteers for the entire show! Everything during the show has to be done in darkness so the puppeteers have to don all-black clothing, including a black mask. All of these, and they still have to maneuver the puppets in perfect synchronization. Definitely no mean feat, especially since we had the chance to try it out for ourselves. 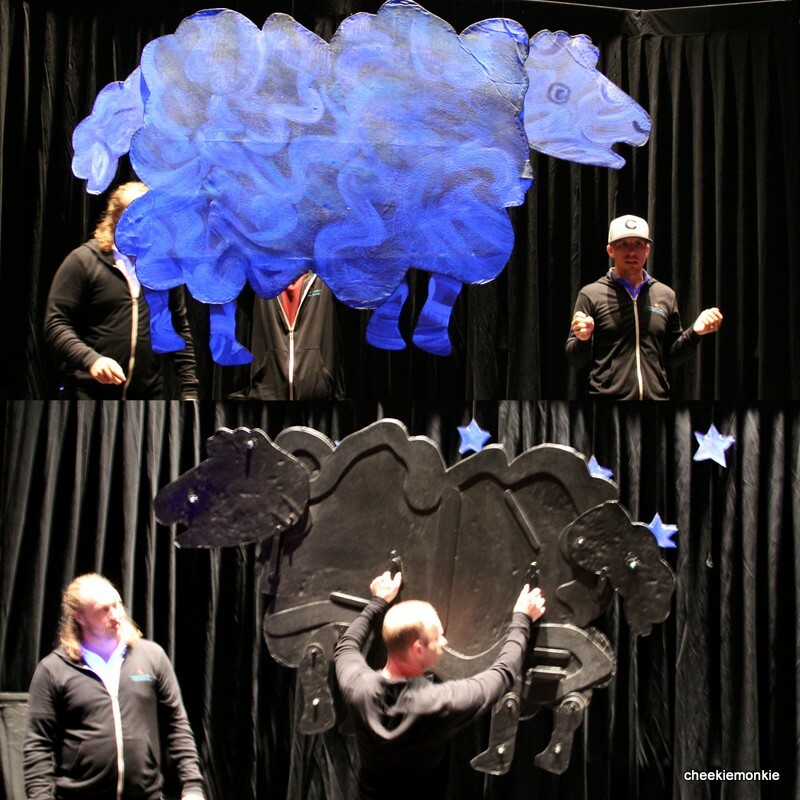 Even under bright stage lighting, the kids and adults found it tough to make the puppets move in a life-like manner! But at least we all had fun. Heh. 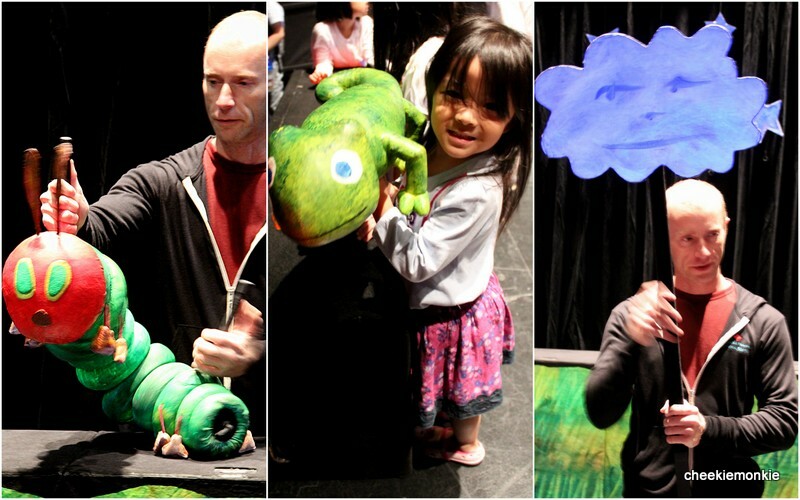 The entire production is made up of three stories - The Very Hungry Caterpillar, The Mixed Up Chameleon and Little Cloud - and with the hungry caterpillar being undoubtedly the fave of all kids present, the chameleon came in a real close second. If you have caught the show with your kids, here's how they make the chameleon's long tongue shoot out to catch the fly! Of all the 3 stories, the 'Little Cloud' must be the easiest to control... erm, right? Well, I thought wrong. Not if you had to hold up a gigantic cardboard in the shape of a cloud... and in total darkness! Even the movement of the cloud had got to be very smooth so proper care has to be taken when walking while making the cloud move sideways. This is so that the audience will not be able to see any sudden jerking movements in the cloud. Tough work, as Ale will tell you. All the hands-on activities must have really hyped up Ale's anticipation for the show, because she just couldn't wait for it to get started! 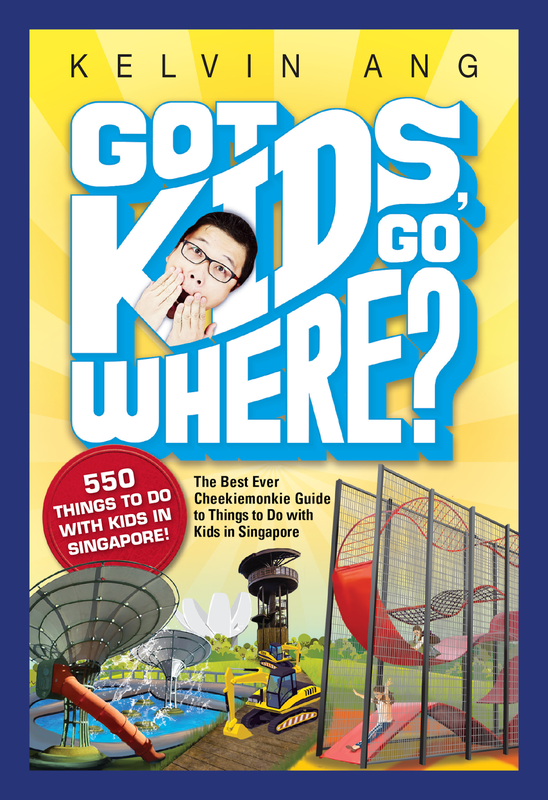 Parents will be glad to know that the show is a strictly 'NO-SHUSHING' one, which meant that kids were free to comment, laugh, and even say the words to the story along with the narrator. If you ask me, this is how it should be for all children's plays! Everything about the show was astounding. The visual effects and puppetry were very fun to watch, while remaining true to Eric Carle's original illustrations. I loved how the show brought the characters to life by adding a dramatic dimension to them but I guessed nothing could be better than hearing the spontaneous applause and laughter from Ale throughout the show. All 3 stories have such simple story lines but each dealt with a common theme: Change. The little cloud and its different shapes & sizes; the chameleon and its different colours; and the change of forms that the caterpillar underwent - all carrying the subtle message of being true to oneself. Oh, and be sure to stay on after the show for the question and answer session where the puppeteers all came onto the stage to field questions from the audience, and also to explain the magic behind the show's fascinating illusions. Which obviously kept the kids utterly enthralled... me too, actually! 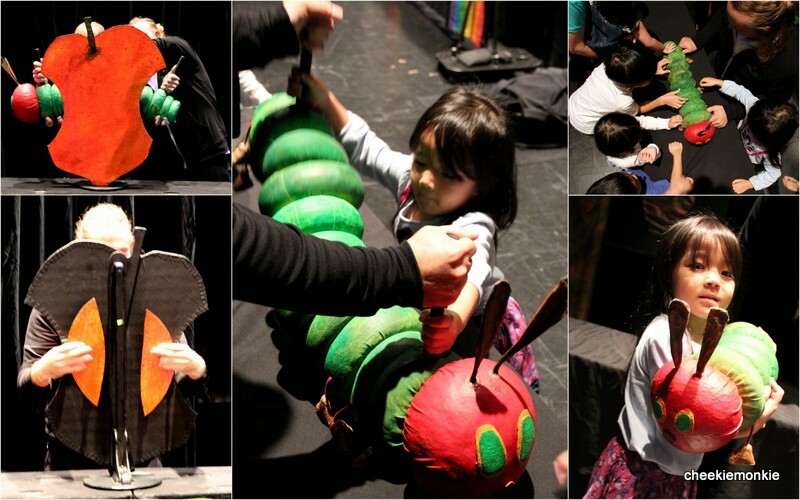 Recommended for children aged between 3 and 6 years old, 'The Very Hungry Caterpillar & Other Eric Carle Favorites' show is truly a theatre experience suited for the little ones. But you will have to be quick if you are thinking of bringing your kids to the show, as the final performance date is tomorrow (5 Oct 2014)!